What are your head-canon scenes? My head-canon scene (or at least the one that sparked this thread) comes at the end of the Palace War. In the comic, Rayek and Leetah are having a little moment and Rayek says "I tried to own when I should simply have accepted... Keep me in your heart." Leetah smiles and gives him a hug and says "You never left it." In my version, she goes on to say "This path leads both ways, my friend. If I had been willing to know my own heart, we would have settled things long ago and we could have celebrated my Recognition as friends or even welcomed Cutter as another lifemate." 1) Kahvi's not Greywolf and Willowgreen's daughter, and not Two-Spear's either. I know that veers very far from canon, but I just think "Ehhh, not a wise plot device" (and that's the kindest way I can put it) each time it comes up. 2) In the Blood of Ten Chiefs story "Love and Memory", Zarhan Fastfire Recognizes Wreath after she Recognized Prey-Pacer. He tells her that Recognition must have misfired between her and his son, and beds her before departing. It's true that he Recognized other elves at the drop of a hat, and the pureblooded elf Selnac started Recognizing over and over even though she couldn't have more children when Rahnee was chief. But honestly, Zarhan Recognizing Wreath just rubs me the wrong way. So I think of it as Recognition misfiring between the two of them and not resulting in any children. Maybe pregnancy hormones had something to do with it, I dunno. 1. Tyldak appeared to Scouter to thank him for raising Windkin. Either during this moment, or at another time, Tyldak found out that Scouter knows Dewshine's soulname and replied with "You were the one who was always meant to know." 3. Moonshade has also been talking with Bowki in the Palace. Bowki recognized and has descendants amongst the Sunfolk. 4. Lutei was the younger brother, and was a trouble-maker as a child. 5. (This occured to me rather recently and is probably completely crazy.) Zey was Yun's younger half-brother (same mother, not same father - obviously). Cutter and Skywise get it on for the first time... maybe in the time period following Madcoil. And then they get it on again while on their quest. And then they get it on again, but with Leetah this time... probably after either the first quest or Kings. I'm thinking after Kings, cus I imagine they were feeling estranged after the original quest ended. Anyways- that. Plus, I imagine Skywise and Yun had some sort of conversation when Skywise brought the pod to Howling Rock, along with Windkin. 1. Haken and Gibra led a group of High Ones and their offspring. This group was separated to two or more groups, and some founded Blue Mountain with Lord Voll, while others became the ancestors of the Rootless Ones. 2. At the end of 'Heart's Way', Vurdah does enter the hut. Heh. For me, at the end of "Heart's Way," Vurdah doesn't enter the hut. Why can't it have been both? She continued playing around with Ruffel, Maleen and Skywise for a while (she is still with them when Skywise says goodbye in OQ6) but she also eventually recognized. It can be anything she wants! As longs as she isn't obsessed with how it has to be or ought to be. I like how Wendy left it up in the air. Sure Leetah was pushing the usual "free love" argument, which shows she didn't learn her lesson about leading others on, but I can choose to believe that Vurdah saw the wisdom in not chasing something that may or may not even be there and didn't go in. "Free love" isn't about leading others on. Maybe Vurdah went in with the understanding that it was just fun, that nothing serious would come of it because there was nothing to chase. There are people who can indulge in pleasures while they wait for what they truly want; as long as the intentions are clear, which they seemed to be with all of them, it's fine. But there are also people who can't do that, who don't see the point or value in indulging when it isn't what they truly want. And that's fine too. The question for me is could Vurdah put aside the expectations she placed on Skywise and enjoy what she had with him, or did she realize that expectations were unfair and because she couldn't avoid them, she separated herself? I think Vurdah decided not to be a part of the trio anymore. Is she pictured at all after Skywise and Cutter left the sun village? Maybe something happened to her? travelbug said: Is she pictured at all after Skywise and Cutter left the sun village? I want Skywise to be life mated with someone really possessive. It would just be amusing to see. Mine would be that Willowgreen, once she removed the wolf blood from Two-Spear's Wolfriders, ran away from the tribe and found the pure bloods that were settled in the place that Nonna and Adar once lived. There she became lovemates with the young leader of the tribe. First born of the High Ones, Voll. Of course, feeling the need to distance herself from her past, she changed her name. The reason why I thought of this is because of Winnowill's utter disdain to the "taint" in the Wolfrider's blood. Then there was the way she easily removed the blood from Windkin. Only Leetah was able to do it because she knew it had been done to Windkin. There was never any indication that she was aware of it being possible before. I didn't mean to equate "free love" and leading people on, at least not beyond Leetah's own behavior during the time she and Rayek were together. That's some interesting head-canon, Mkal. It fits, too, though Leetah certainly knew it could be done because she'd done it with Suntop. manga said: That's some interesting head-canon, Mkal. It fits, too, though Leetah certainly knew it could be done because she'd done it with Suntop. I don't know that that's necessarily been confirmed. I picture Maleen taking a moment to remember and mourn for Ruffel. i think Vurdah entered the hut. Shuna is using some of the palace's magic to just make herself look old, and might actually look more elfin thanks to Mommy Leetah. Korafay is trying to conver the Wavedancer's into a nudist colony. Ohler and Newstar are quickly becoming lovemates and lifemates. Tam, Maleen is celebrating Chitter's arrival with Skywise, Ruffeel, Shenshen and Newstar. I think we saw a glimpse of her in the palace not to long ago. Was it #3 perhaps? An elf looking very much like Maleen is in the palace when Windkin comes flying in looking for Moonshade. Hair and face looks the same, but she has got some new clothes. travelbug said: I think Vurdah decided not to be a part of the trio anymore. Is she pictured at all after Skywise and Cutter left the sun village? Tam said: I don't know that that's necessarily been confirmed. I believe it has, in the story "Leetah's Song." Should be somewhere in EQ Volume II, I think. The song was later quoted by Elfmom in the story where Suntop became Sunstream. Mkal, if I remember this right (I haven't read most of the BoTC books), your head-canon would make Winnowill Khavi's mother. manga said: Mkal, if I remember this right (I haven't read most of the BoTC books), your head-canon would make Winnowill Khavi's mother. It would also mean that Two-Edge has the hots for his niece. I did read the story, Thornbrake, and it looks to me like it took Leetah's healing power to make the transfer. "Blood of High Ones is your right, and so unto you, now, it goes." manga said: I believe it has, in the story "Leetah's Song." Should be somewhere in EQ Volume II, I think. The song was later quoted by Elfmom in the story where Suntop became Sunstream. Like @Thornbrake said above me, Suntop was already immortal in the womb, and Ember wasn't...the song is about agreeing not to edit Ember's blood. travelbug said: Tam, Maleen is celebrating Chitter's arrival with Skywise, Ruffeel, Shenshen and Newstar. Like I said: "Blood of High Ones is your right, and so unto you, now, it goes." The transfer did not happen without Leetah. There's no need for the "high" blood to "go" to him if it's not already there. Suntop and Ember were both half-mortal, to begin with, but through their choices and Leetah's help, Suntop became fully immortal and Ember became fully Wolfrider. That could just mean the blood itself is going to him, not that she's putting it there. Or it could just be a comment about the state of things, how it worked out in the womb, and worded that way to rhyme with the first line. It doesn't have to mean that Leetah put it there herself. What Thornbrake said is true, actually. The whole point of ''Leetah's song" was that Leetah realized, being a healer, that one of her children would end up being immortal, but the other was going to be mortal- because Ember had "called the wolfsong to her." Leetah could stop this, if she chose. She could have inhibited Ember's natural development and forced her to be immortal like Suntop. But she decided that would be wrong- that she would be altering her child's nature.. and that it wasn't her place to do that. She had to let her daughter be who she was meant to be. But it was a difficult decision for her. 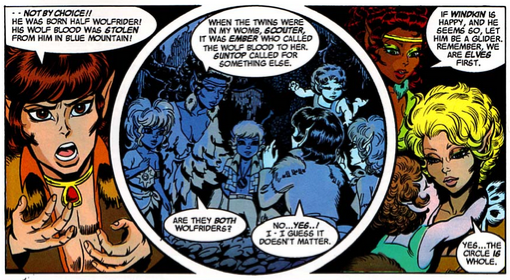 So, according to this story... and granted, this story is obscure, but considered part of Elfquest canon... Suntstream is naturally immortal, because he was born this way- not because Leetah tampered. But that still validates my original point, which is that Leetah already knew how to remove Wolfblood. It didn't take Winnowill to teach her it could be done. "When he learned of his tribe's mortality, I hoped he would choose, by my aid, to defy fate." She's referring to events in book 3, during the Original Quest. So she has known at least that long that she can remove Wolfblood. manga said: But that still validates my original point, which is that Leetah already knew how to remove Wolfblood. It didn't take Winnowill to teach her it could be done. Oh my gosh- I totally see what you mean. You are right! If she thought she could do it with Ember and had to debate whether that was right or wrong... obviously she knew she could do it. I guess Thornbrake and I were two steps behind you. We didn't get the point you were making! Hmm... I wonder though... is it possible that Leetah only thought she could do it back them because the fetuses were growing inside her body and were at a certain point in development? Preventing a fetus from a developing a certain way or directing it to develop in a different way has to be different from removing the elements of mortality and wolf instincts from a fully grown elf? manga said: "When he learned of his tribe's mortality, I hoped he would choose, by my aid, to defy fate." She's referring to events in book 3, during the Original Quest. So she has known at least that long that she can remove Wolfblood. Yes- I guess you are right... that would suggest that she asked Cutter if she could remove his wolfblood in Book 3. Hm. Why didn't she ask him before, I wonder? Was she really never going to tell him if Winnowil didn't? Keeping that information secret makes sense if she thought there was nothing she could do about it- and that knowing could only upset him. But if she knew she could have offered him the alternative of immortality... why not tell him? And why not tell him and offer this right away- instead of being so freaked about about the recognition? I personally think that, you do have a point- she must have suspected this was possible.. but that one of two things happened. Either she asked Cutter right away after Winnowil told him- and he told her no, and to keep it secret from the rest of the tribe. Or... She wasn't sure she could do it until Winnowil did it to Windkin. And her offer came after that. I think... I think it's the latter. Winnowil said that "had he [Windkin] not been a product of Tyldak's wholesome seed, he would not have survived the work I have done on him." It doesn't seem, at that point, that Winnowil thought full Wolfriders could be changed. If Winnowil didn't think it was possible- why would Leetah? You know what I think? What I really think? At some point between "Siege of Blue Mountain" and "Kings of the Broken Wheel," the authors changed their minds. lunakat said: I think... I think it's the latter. Winnowil said that "had he [Windkin] not been a product of Tyldak's wholesome seed, he would not have survived the work I have done on him." It doesn't seem, at that point, that Winnowil thought full Wolfriders could be changed. If Winnowil didn't think it was possible- why would Leetah? I think you could be right but on the page where Leetah was talking about this, the image was Cutter and Leetah in front of the great Egg after the confrontation with Winnowill. It may be Winnowill's racism talking. It may also be that the WAY she chose to remove his Wolfblood is the issue. She's not the type to care about any damage she does, whereas Leetah would look for a better way. And of course, the authors could have changed their minds. manga said: I think you could be right but on the page where Leetah was talking about this, the image was Cutter and Leetah in front of the great Egg after the confrontation with Winnowill. True- but they are only talking about the fact that he will die. She isn't offering, at that point, to remove his wolfblood. That never gets mentioned. He just says that he's resigned- that "Bearclaw always said a Wolfrider's life was short and sharp.. then I met Savah and I dreamed of living forever... But I'm awake now and the truth is good." I just think that was the point at which Leetah would naturally have said "But you can live forever, beloved! I can realize that dream for you with my healing abilities!" If she had known she could do it. Instead, she just stands there and cries. manga said: It may be Winnowill's racism talking. It may also be that the WAY she chose to remove his Wolfblood is the issue. She's not the type to care about any damage she does, whereas Leetah would look for a better way. manga said: And of course, the authors could have changed their minds. That's my personal guess. Just because there do seem to be some mild inconsistencies here. Nothing overt- but just... I don't think Wendy would have written the story that way, especially that Blue Mountain scene, if she had planned that twist from the start. I think that was retroactively integrated. On the other hand, throwing that idea in does not technically contract what came before. It's just mildly inconsistent. It's definitely something that can be rationalized. manga said: I did read the story, Thornbrake, and it looks to me like it took Leetah's healing power to make the transfer. I guess there are two ways to interpret this, then. One is Manga's way. And she's right- that does seem plausible. Personally, I think that Leetah just chose not to inhibit or interfere with what was already happening naturally. RedheadEmber said: It would also mean that Two-Edge has the hots for his niece. Correct. And even then, I don't think she knew it was even a possibility. It was not until after Windkin was changed that the understanding that Suntop had no wolf blood in him was realized. @RedheadEmber: There is something that you brought up that makes me wonder even more. In the 'non-canon' anthologies, Rellah learned that Willowgreen and Greywolf had recognized. She decided to set up a trap so Willowgreen would see Greywolf for the animal he was and reject him. What if that trap worked too well and she not only rejected him, but rejected the whole idea of the wolf blood, despite her vision? Especially in the life growing inside of her? Would she not work her healer's magic on her own cub and remove the wolf blood from her, thus making little Kahvi not as great a hunter as her age-mates? I must say... i like that explanation better than a pool of magic. She might have done something to the water as they were leaving to preserve her body. She makes the comment about her 'plan' and how long she had been working on it. Could Kahvi had been a part of the plan to get the elves to the Palace? But circumstances forced her to choose another course of action. The Palace was gone in her mind. @Mkal, I gotta have to ask you about your Willowgreen is Winnowill theory? How is that even possible? The entire mess with Two-Edge happened while Timmorn was still chief, and the Gliders had probably lived in Blue Mountain for at least a few centuries before that. However, the Willowgreen removed the wolfblood of her unborn child (Kahvi) theory makes perfectly sense.